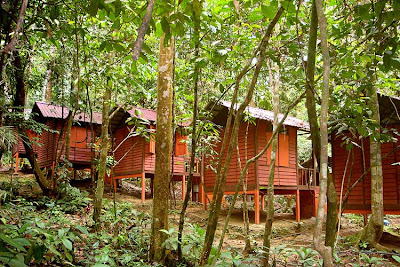 Endau Rompin is the second designated national park in Peninsular Malaysia. 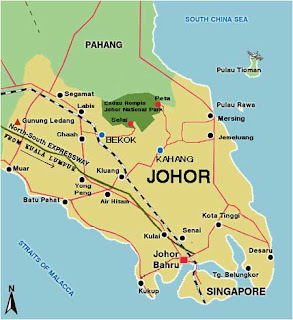 Its name is derived from two rivers through the park, the Endau River in the south in the state of Johor and the Rompin River in the state of Pahang in the north. With rock formations dating back some 248 million years, Endau-Rompin is mostly hilly with some prominent sandstone plateaus. 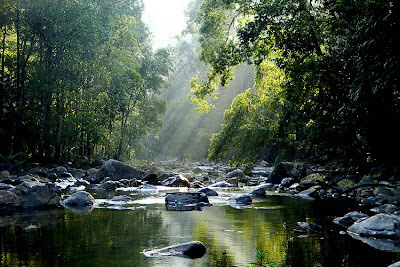 It is the watershed of several rivers such as Endau River, Selai River and Jasin River. A map showing the location of ER. Compare the size of the national park with Singapore island! Selai is the western gateway to Endau Rompin Johore National Park . An Orang Asli legend has it that there was once a celestial princess who possessed the power of innate body heat . When she descended upon Earth , the scorching heat that emanated from her body led to a drought. This caused the mighty river that flowed from Gunong Besar to be reduced to a mere trickle- the size of of a strip of rattan - or "sehalai rotan". Hence forever after, the river was called Selai, and the park that was later created there took this name. It is home to one of the world’s oldest rainforests as well as unique flora and fauna, including the endangered Sumatran Rhino. Selai was officially opened to public in 2003. It is the second gateway to the Endau Rompin Johor, National Park. The park has an area of 48,000 hectares of which 2/3 is located at Selai. Selai is named after Kampung Selai, an Orang Asli village near the entrance.Bekok, the nearest town to the Park, is about 26 km to Selai. Selai is the land of endless waterfalls. Countless waterfalls - great and small are found inside the park. They are really the jewel of the forest. Some of the well-known waterfalls are Takah Tinggi, Takah Pandan, Takah Berangin &Takah Beringin. 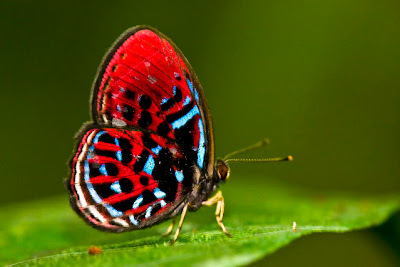 Over a weekend in May, a small group of butterfly enthusiasts from Butterfly Circle including local entomologist Khew SK, Sunny and Irene Chir, the twins Mark and Anthony Wong, Ellen Tan, butterfly gurus from Kuala Lumpur, LC Goh and Koh Samui, Les Day made their journey to Endau Rompin beginning with an unearthly 5 a.m. train ride from KTM Tanjong Pagar Railway Station to the small rustic town of Bekok near Segamat. Train station at Bekok (smallest one I've ever seen!) and we hopped off the train onto the railway tracks with our baggage, and we're good to go! 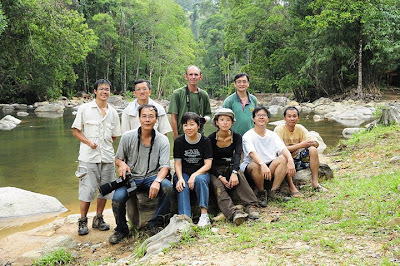 We were also honoured to have Dr. Jeff Lum from Malayan Nature Society , Johore (MNSJ) joining us for the trip. From the sleepy town of Bekok, the little group rodeo-cowboyed up to Lubuk Tapah camp site in two rented 4X4 vehicles through the Johor Endau Rompin West entrance. The beautiful scenery of rolling hills, amazingly tall trees and the cool breeze through the jolting open windows was nothing short of breathtaking.And no sooner than when we had passed through the gantry point (which consisted of nothing but a humble iron bar and a smiling local standing next to it), the butterflies began to make their presence felt.We found ourselves stopping to identify passing Papilionidae along the mud road and craning our necks out of our windows to get a closer look. 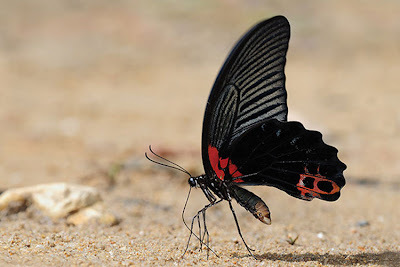 When we arrived at Lubuk Tapah, we were immediately welcomed by several brilliantly coloured red-naped Rajah Brooke Birdwing (Troides brookiana mollumar). A shallow river runs through Lubuk Tapah lined with leaves and filled with fish. 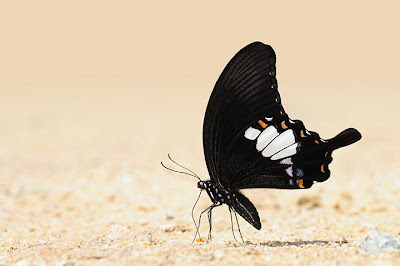 At the sandy banks of the river, many species of butterflies came down to puddle in the hot humid weather. 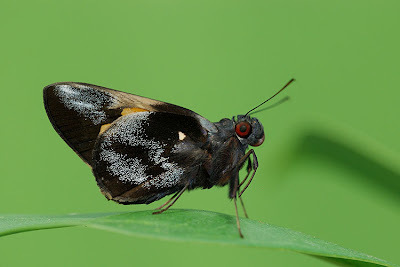 Along the sandy river banks, various usually high-flying papilionidae like the Great Mormon, Tailed Jay, Red Helen and Blue Helen came down to puddle alongside a Lesser Albatross, a tiny visiting Maplet and a favourite with the group – The Red Spot Sawtooth (Prioneris philonome themana). The river at our campsite begins and ends with a small rushing waterfall, on which you can sit and soak in the sights and sounds of Lubuk Tapah: Great Mormons flying overhead, damselflies resting on wet rocks near the waterfall, torrent frogs quietly hopping along the rocky banks and birdsong echoing from the trees while cool, clean springwater water rushes all around you, running through your clothes, your hair and your toes. Lubuk Tapah runs on generator at night from around 7p.m. to 11p.m., after which the camp is plunged in the blackness of rainforest night. Unlike city folk ideas of eerie silence and pitch darkness, Lupuk Tapah is a nocturnal symphonic cacophony of calls, whistles and croaks in a blanket of night pierced by the occasional sparks of dancing fireflies. On Day 2, we trekked 3km from our campsite to a site where some of us had hoped to revisit the elusive and skittish Green Dragontail (Lamproptera meges virescens). 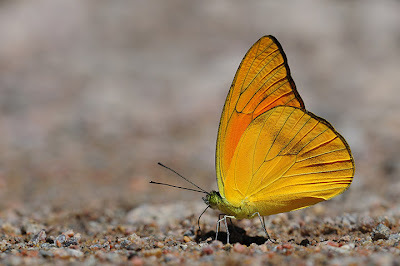 After waiting a considerable time for it, most of us got away with a record shot of the extremely shy but dazzlingly designed butterfly. On the morning of Day 3, the group was up bright and early, and set out towards one of the nearer waterfalls. 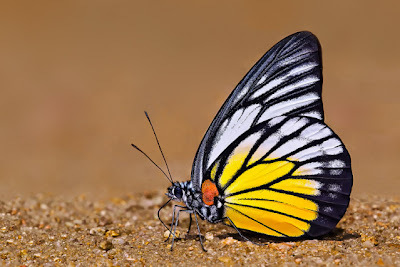 The narrow, slippery path proved to be quite difficult for shooting butterflies for a gang of 7 trigger-happy photographers, so some of us turned back and headed towards base camp. 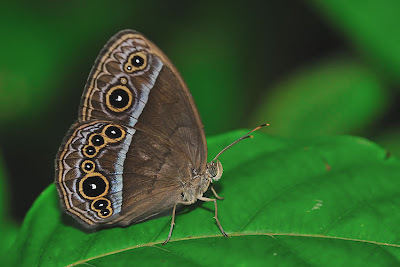 Shortly afterwards, the cloudy conditions weren't really conducive for the shady trail, and the whole group headed back towards the main road where more butterflies were expected to be. 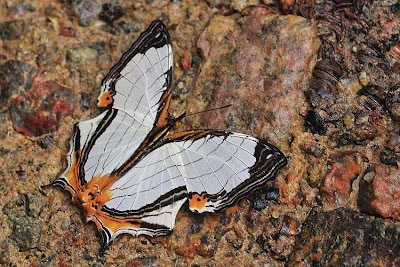 A few of the photographers were extremely fortunate to come across the Banded Harlequin (Paralaxita orphna laocoon) with the help of the eagle-eyed Orang Asli guide, Jafri. A rare Riodinid, the Banded Harlequin stopped to say Hi! 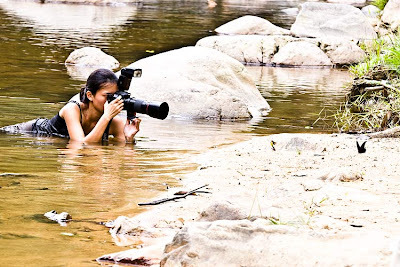 On an ending note, intending travelers with SLRs and other electrical devices should be aware that Endau Rompin is a rainforest and that preventative measures should be taken for the possible amount of moisture that might get in your expensive camera systems. 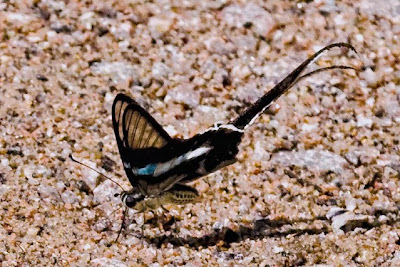 That includes not getting in the river with your camera to photograph butterflies even though that’s hard to resist at times. Because of the moisture, don’t count on recycling your trailwear by washing them and leaving them out in the sun because they never seem to dry out fast enough. Photographers intending to go off-trail into the brush should also wear leech socks or pantyhose (Sunny's new anti-leech weapon!) to disappoint the dozens of leeches waiting to go home with you. 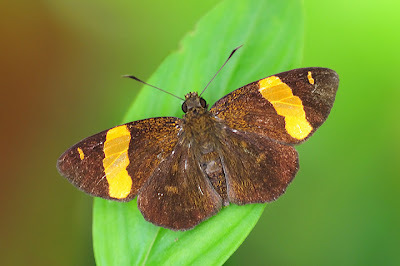 A lifer shot of the Small Redeye (Gangara sanguinoccolus) a very rare Hesperiidae which was found on the leech-infested Bertam Island. But all too soon, it was time to go home, and our 4x4 drivers were ready to pack us off back to Bekok Town and the train station. After a pit stop at a local kopi tiam for some refreshments, we were back at the little Bekok train station platform, and waiting for the train to arrive. The journey home was uneventful, with the usual train delays, and we reach little ol' Singapore after 7pm, weary, bone-tired, hungry but happy and looking forward to the next ER trip! A Group shot for the album!